Pet Talk: Know when to be a hero and when to keep your distance. You’re out for your morning walk, minding your own business and suddenly, you see a dog, walking alone. You may have only seconds in which to act. But what should you do? Do you run away? Do you try to rescue him? If the animal seems friendly and not aggressive, you may choose to rescue him. If the animal appears at all aggressive, follow these four rules: (1) don’t talk to the animal; (2) don’t make eye contact with the animal; (3) don’t touch the animal; (4) stand still if approached. Use caution when approaching the animal. Speak calmly to reassure him. Make sure he can see you at all times as you approach, and perhaps entice him to come to you by offering food if available. If the animal still appears to be friendly, slowly continue to approach and avoid making eye contact. Look down and to the ground. Let the animal sniff the back of your hand as you approach or as he approaches you. If possible, restrain the animal. Create a barrier using your jacket, a towel, a box or whatever you can get your hands on to keep the animal from leaving the area. If the animal is friendly and you have him restrained, see if the animal is wearing an id tag around his collar. As soon as possible, try contacting the owner if their name is listed. If there isn’t a tag, call animal control and attempt to stay with the animal until they arrive. If you are willing to rescue a stray animal you see while you are driving, follow the same steps to approach and restrain the animal. Be sure to signal and put your hazard lights on when you pull your car over to the side of the road. You can be prepared ahead of time with these items in your car: a cell phone, the phone numbers of local animal control, a cat carrier or cardboard box, leashes, heavy blanket, an animal first aid kit, water bowls and water, strong-smelling foods, such as canned tuna or dried liver. 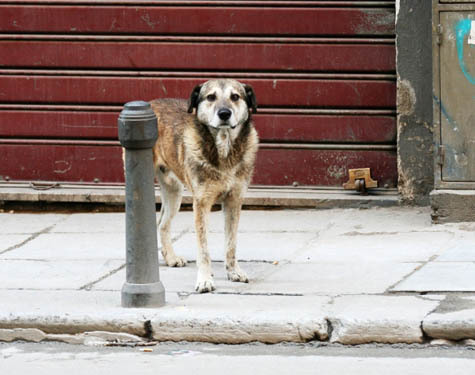 If you’re uncertain about whether or not to assist an animal, here’s a final word of advice: If for one second you do not feel comfortable, do not assist a stray animal, injured or not. Children should never assist a stray animal without an adult nearby. And if you are bitten or scratched, be sure to see your doctor right away!